We received complimentary visits and stays at some of these locations. However, all opinions expressed are my own. We moved back to Cleveland last July but my husband was still transitioning out of the military. So we really didn’t get to take advantage of all that Cleveland has to offer. 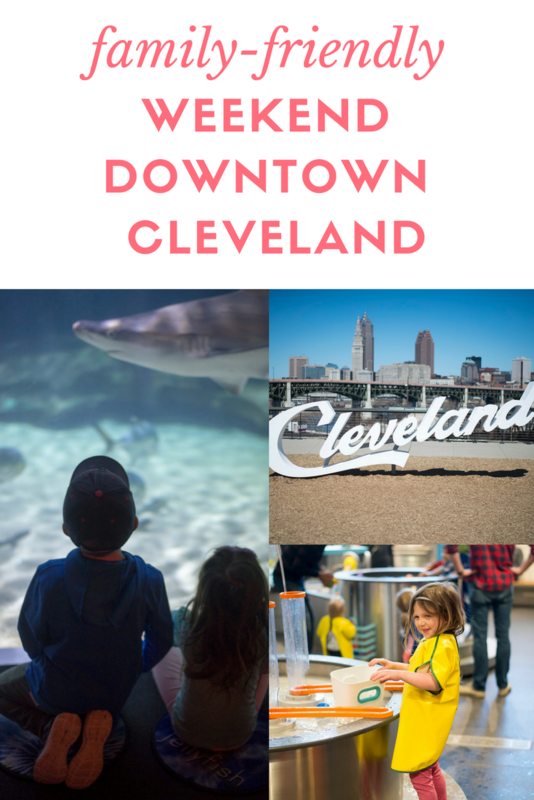 And while it’s much more booming in the summer, there really are family-friendly things to do in Cleveland all year round! I decided to make a weekend out of it and do as the tourists do! I planned our itinerary and prepared for a jam-packed, family-friendly weekend downtown Cleveland. We hopped in a Toyota Prius Advanced and it was the perfect car for zipping all around the city. Good on gas? Count me in. 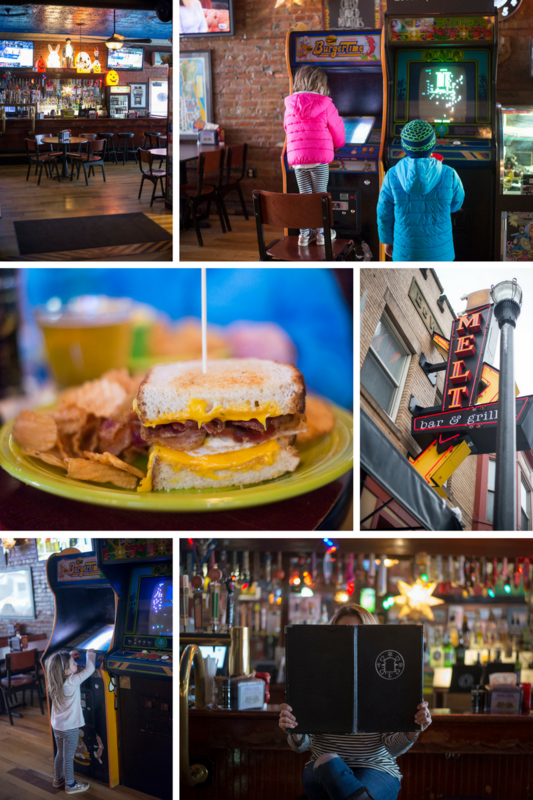 Our first stop was MELT Bar and Grilled, which is located just outside of Cleveland in Lakewood. They’re known for their famous gourmet grilled cheese sandwiches and boy were we in for a treat. There were SO many options and beyond that, there were ways to customize them and make them your own! It was insane! They also had a delicious kids menu, retro video games, and even had Paw Patrol on TV… I mean, does it get more kid-friendly than that?! The kids loved it and I can definitely say we will be back to tackle another sandwich off the menu! Once our bellies were full, we headed to the Great Lakes Science Center. We had taken the kids once before but didn’t get to spend as much time there as we might have liked. So this time, we made sure to see everything and take advantage of all they have to offer. You can also purchase tickets for the IMAX theater and when the weather is nice, take a tour of the Steamship William G. Mather (open May-October). There are hundreds of hands-on exhibits and something for kids of all ages. Head to the Polymer Fun House if you have smaller children (7 and under) or the more advanced experiments for the older kids. They didn’t have the “brickbuster Build It” exhibit open last time we were there so the kids were super excited to get their hands on that! Inspired by the endless possibilities of LEGOS, it features a ton of different areas, models made out of LEGOS, and even a little train! 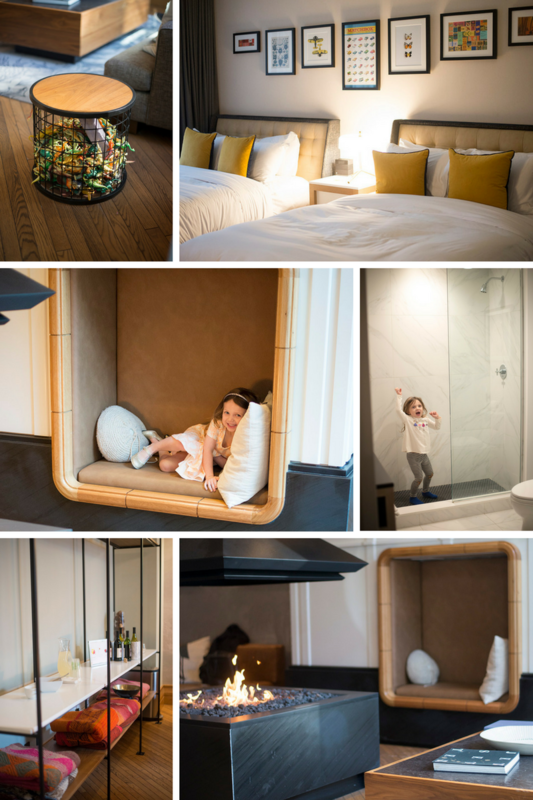 The Kimpton Schofield was kind enough to host us for the weekend and I was SO exited! I had heard from numerous people it was one of the best places to stay downtown. 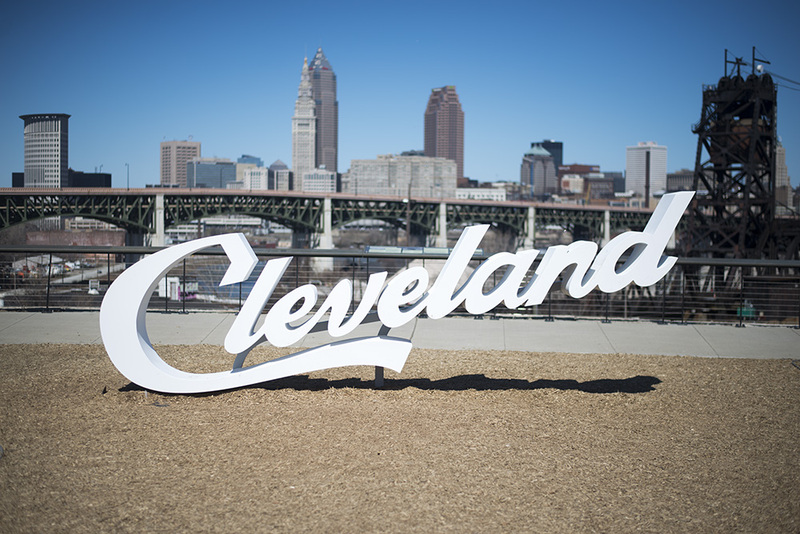 Located conveniently on East 9th street, you’re just a hop, skip and a jump from some of the best Cleveland attractions. It also has a retro chic vibe and is an experience in itself! They were having “wine hour” when we checked in which of course I couldn’t participate in (boo pregnancy) but I’ll be back! Friday night we made reservations at TownHall which I had heard was one of the most family-friendly restaurants in Cleveland. It’s located in Ohio City which is slightly west of downtown. But to me, it’s still considered downtown and part of the experience. They’re known for their non-GMO, vegan, healthy but balanced menu options. They also featured a ton of craft beers, fresh juices, and more. They gave the kids balloons and surprised us with a firecracker cookie dessert! The kids were complaining it was a little loud (it was Friday night and PACKED) but they got over it. To me, it just proved how great of a place it was and clearly, THE place to be! We had reservations at Corner Alley to end the evening with a little friendly competition bowling experience. 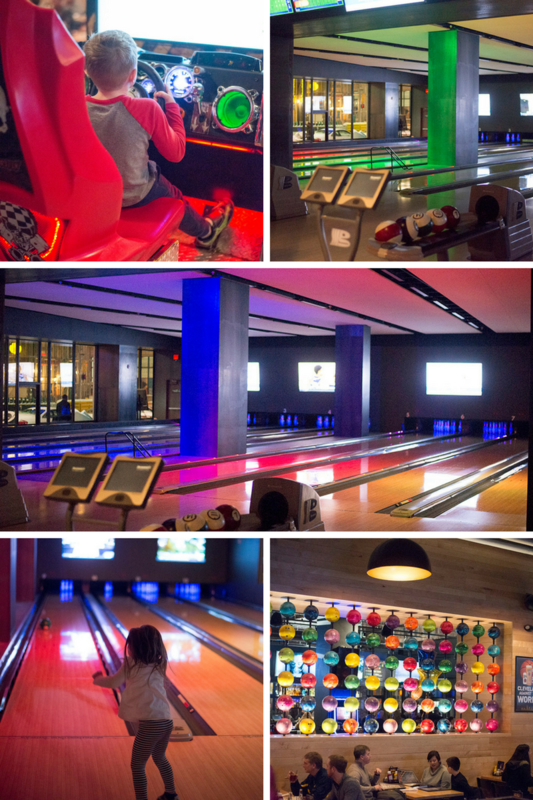 The Corner Alley features state-of-the-art bowling, great drinks, delicious bites and HD TVs to watch the big game. Such a great spot for the whole family. I wish I could have had a drink at the bar but there’s always next time! We were there around 7:30 p.m. and it wasn’t too crazy yet, but I would say the best time to go with the family would be during the day. Saturday morning we kicked off our day with Brunch at Parkers, which is on the Kimpton Schofield property. The kids both ordered Cinnamon Roll French Toast and omgggggg was it good! I had the biscuits and gravy and Z had bacon, eggs, and homefries. It wasn’t super crowded yet which was nice, and the service was impeccable. Their menu is designed by Cleveland native Andrew Gorski and features urban dishes, favorites, and specials throughout the week. 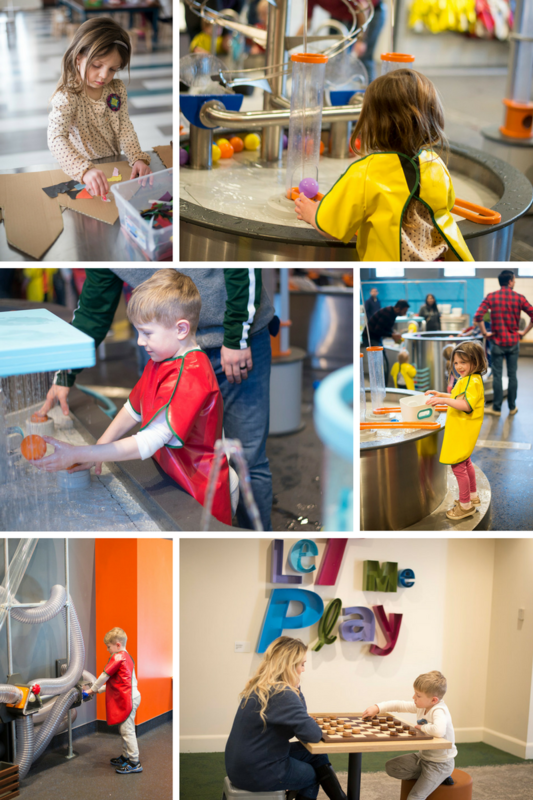 Our first stop Saturday after brunch was the Cleveland Children’s Museum, which was just recently renovated. We had never been there before and were excited to check it out. 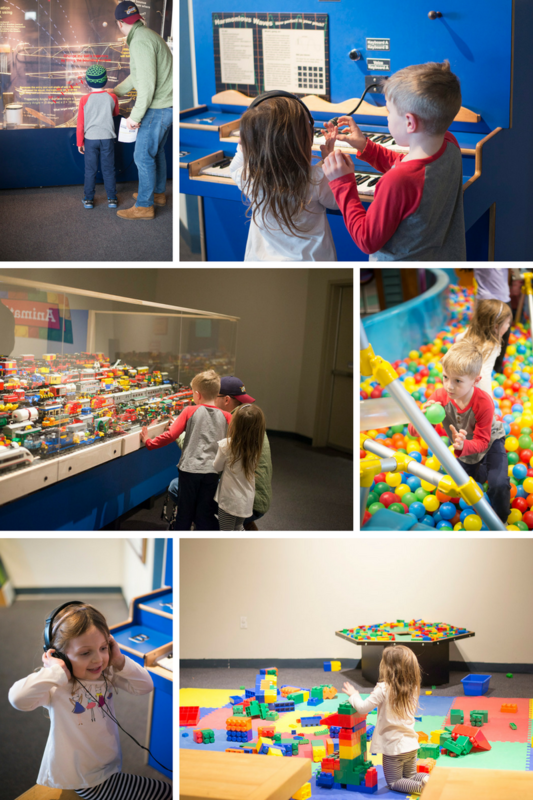 They have a ton of different exhibits, best suited for children ages 0-8. We got there right at 10 a.m. when they opened and within a few minutes, the place was PACKED! One of the employees told me Tuesdays and Wednesdays are the best days to go so I will keep that in mind for next time! But they had so many different things for the kids to do; arts and crafts, reading corner, water play, supermarket, and more. 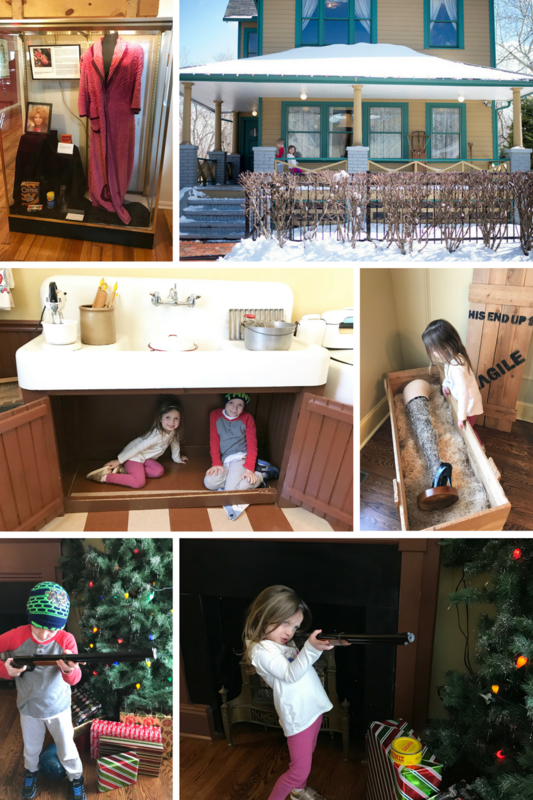 After the Children’s Museum, we headed over to the Christmas Story House. I’ve lived in Cleveland all my life and never had a chance to tour the house and museum, so this was a must see. We’re huge fans of the movie so it was really cool to be inside the house where the movie was made. The tour guide also told us about the history and how the owners spent 2 years (and a ton of money) to re-do the home frame by frame for accuracy. The kids loved being able to pick up the props, answer the phone, and hide under the sink for a photo opp. So kid-friendly and fun for the whole family! After touring the house, we were able to walk over to the museum and see a lot of the original costumes and props. After all of that, we were starving! So we walked across the Street to the Rowley Inn. 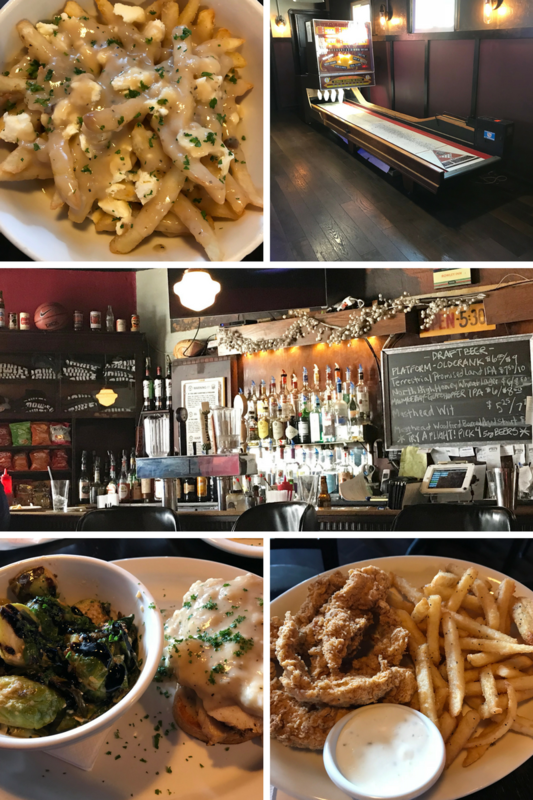 The Rowley Inn is a neighborhood pub with good food and great drinks. And oh my heavens I wish I could have tried more of the menu because what we did have was SO good! Poutine is one of my favorite foods and this may have been the best I’ve ever had. I’m pretty sure I ate the entire bowl by myself. Oops. I ordered the Bumpus Hounds Lunch (if you’ve seen the movie you know what the Bumpus Hounds are) which was an open-faced turkey sandwich with bacon, mashed potatoes and gravy. Seriously, my mouth is watering thinking about it! My husband had the homemade breaded chicken tenders and the kids ordered off the kids menu. This restaurant was also very kid-friendly and had a bowing machine and retro games in the back too! My son started feeling sick after lunch so we weren’t able to head to the Greater Cleveland Aquarium as planned, but made a trip the following weekend to check it out! Prior to being the aquarium it was the Great Lakes Powerhouse, so the building itself is already super cool. Sharks are always one of the coolest attractions and their shark tunnel did not disappoint. They also held an underwater Q&A while the diver was surrounded by sharks and the kids loved it. We weren’t there for it but they also have a shark feeding on the schedule! I loved how hands on everything was too. The kids were able to try and feel stingrays and other crustaceans, put on a puppet show, and ask questions during the Q&A. And while it’s not one of the largest aquariums I’ve been to, there was certainly plenty to do, not to mention the atmosphere itself was amazing and the staff was more than knowledgable and hospitable. After the Aquarium we drove across the bridge to the East Bank of the Flats for lunch at Margaritaville! Which is of course, a national tourist attraction but fairly new to Cleveland. So we needed to scope it out! 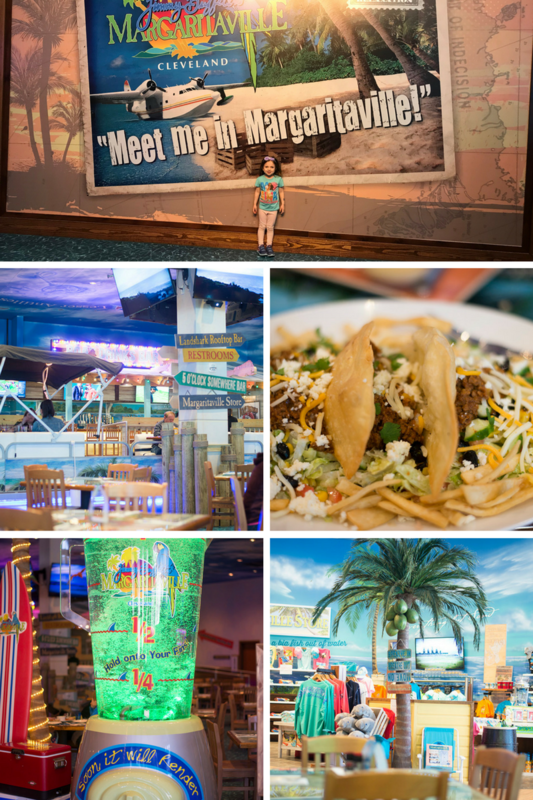 The atmosphere was very family-friendly and it really felt like we were on a tropical vacation. You can even eat INSIDE a pontoon boat or sit at the tiki bar (obviously without the kids on this one haha). In the summer they have a rooftop bar which also sounded amazing but that will have to wait until the weather warms up. I will say, their menu is one of the more pricier ones of the places we visited, so you’re definitely paying for the experience of being at Margaritaville. Before heading out, we stopped in Tremont at the infamous Cleveland script sign! It’s such a great view of the city and the perfect cap on a tourist trip! 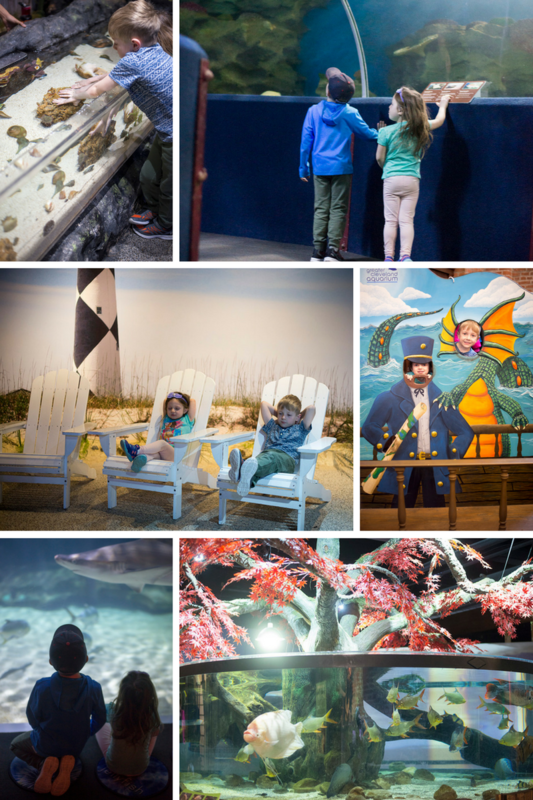 We had SO much fun exploring our own city and scoping out some of the best family-friendly activities in Cleveland. If you need any more recommendations, please let me know! I still have an entire list of places I want to check out the next time we’re down there 🙂 Happy adventuring! Way to go Samantha. Great highlights of an amazing city, showing can also be family friendly. Just enough to peak everyones interest. 😊👍🎶💕. I ❤️ Cleveland! 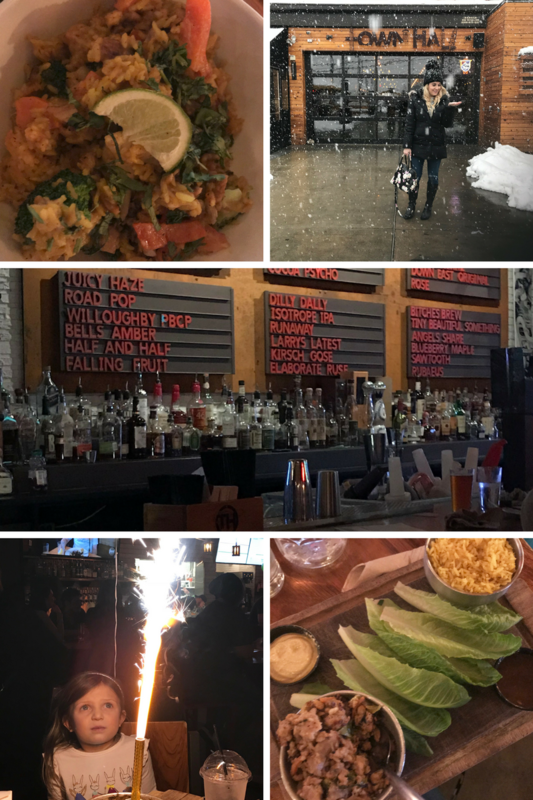 The Rowley Inn, Melt, & Townhall are a few of my faves! The Lakewood Melt location is closing for a few months to renovate, but luckily there are still, like, six other locations. 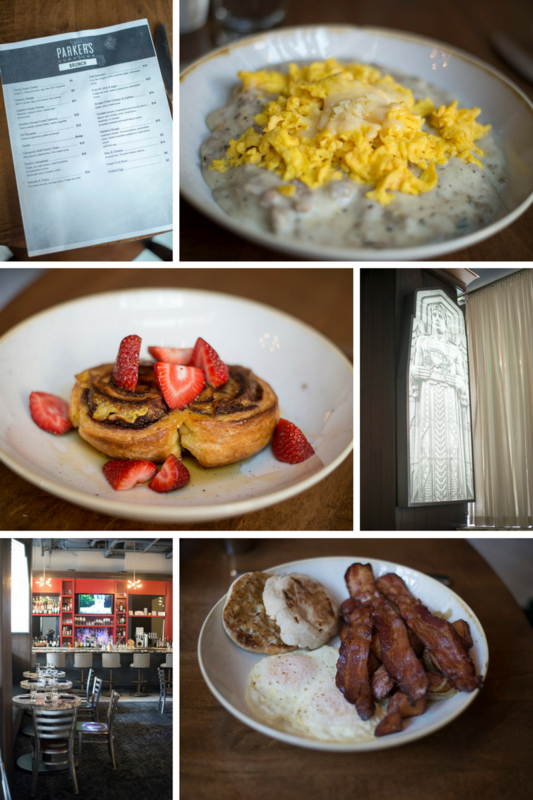 I love their chorizo & cheddar sandwich – & that cinnamon roll French toast looks incredible. This sounds like so much fun. What a great list of ideas for families! Sounds like such a great time. 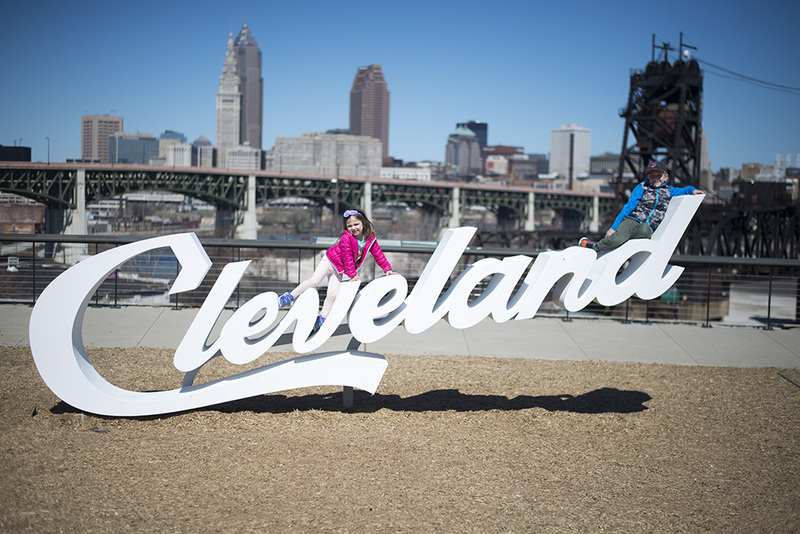 People don’t realize how many family fun activities there are to see and do in Cleveland! Even I didn’t realize it! SO many more things I want to do and explore!